A few of you are surely thinking… nougat in a starter? Nougat canapés? 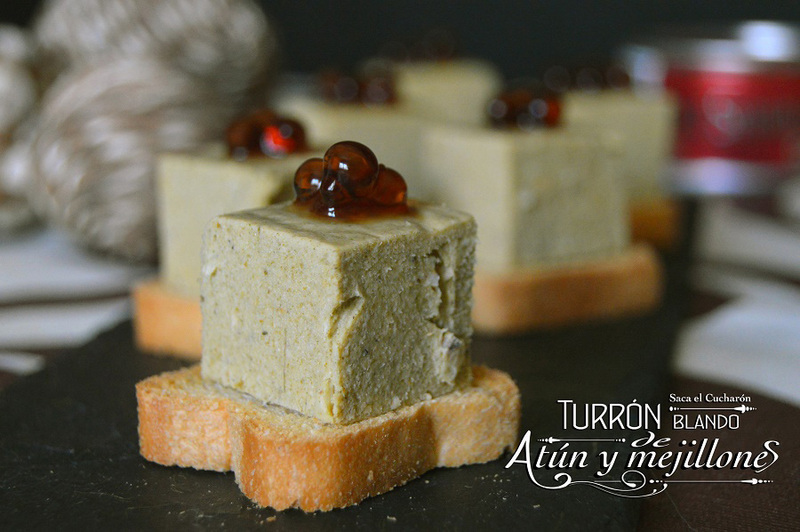 Well yes, my friends, because Sofía has got out her ladle and has prepared a very special “turrón” (nougat) for our Christmas canapé competition. Take note and we guarantee that you’ll surprise the whole family. Open the tins and drain the oil from inside. Put the rinsed tuna and mussels along with the cream cheese in a saucepan and grind well with a blender. Meanwhile, hydrate the gelatin leaves by soaking them in cold water. Heat the mixture of tuna, mussels and cheese. When it’s hot, add the well-rinsed gelatin (there should be no water dripping off it). Mix well and pour into a mold. Cover with clingfilm so the top doesn’t dry out and leave to cool for two hours in the fridge. To serve, remove the mold and decorate on top with the Pedro Ximénez vinegar pearls.